GenericDoctor.com is an online pharmacy that claims to offer the lowest price for generic medicines which would attract everyone. They claim to be a pharmacy that has the best prices for all your generic medications which I hope is true and they also claim to offer world wide shipping to everyone around the globe. There is information that I have managed to find on their website that suggests the site has been opened in 2010 meaning that it is operating for the last 8 years which is a long enough time to have trust in the company so hopefully that’s true either. They are claiming to have a lot of loyal customers due to the fact they are offering the highest quality medications at the affordable price to people world wide. Except for the fact they are selling generics at the best prices, they also claim to offer branded drugs as well. according to the information placed on the site, they are have partnerships with companies in the UK, Canada as well as some other countries in Asia. All the medications are safe to take, of a highest quality and certificated and that’s because they are sourcing the drugs only from FDA approved Indian manufacturers. Besides being a legitimate pharmacy, they claim that all customers’ privacy and security is taken very seriously. Customers satisfaction is their top priority meaning that everyone is going to get top service here. they also claim to be an active social media user company which people can follow their activity on Facebook and Twitter. This all sounds good but I am going to need to check it all. As said, this is a company that is selling both generic as well as branded medications which are obtained exclusively only from reputable and international well known manufacturers. They claim that all drugs are approved by Indian FDA and WHO. But make sure that this is Indian FDA and not the USA FDA as there is a difference. The medicine should be safe to take and effective. Although they sell both generic and branded drugs and they sell both prescription and OTC drugs, they are mostly oriented in selling generic prescription drugs. As they claim, the pharmacy is having a very wide assortment of medications, by checking the categories of drugs myself I have found out the pharmacy is offering many different drugs for conditions such as: Men’s Health, Weight Loss, Inhalers, Women’s Health, Allergy, Skin Care, Men’s Grooming, Herpes, Diabetes, Pain Relief, Hair Loss, Alzheimer, Nausea, Anti-Depressants, Antibiotics, Heart Disease, Cardiovascular, Cholesterol, and there seem to be a lot many more conditions. Although they offer many different drugs, I did noticed they are offering mainly ED medications as the main drugs for this condition are listed among the list of categories of drugs. I found out they are offering many different drugs as the ED type of drugs has the richest assortment. There are a lot of different medications for this condition as much as it seems. All in all, there are a lot of different drugs, both branded and generics. It does seem that customers are having a high chance to find whatever drug they are searching for at this pharmacy, for this reason I am going to rate them with a high rate of 5 stars. It is obvious they might not source absolutely all drugs here, but they do seem to offer the most searched drugs and so people have high chances to find whatever drugs they are searching for. GenericDoctor.com is an online pharmacy which is guaranteeing that customers are going to find the lowest possible prices for all the medications found in their catalog online. It is obvious I wanted to check if that’s true and so I am going to pay more attention to the most used ED drugs such as Viagra and Cialis. I found out by doing my research that the brand Viagra on this pharmacy is priced with 14.75 USD per pill which is the lowest possible price at this pharmacy. to be honest, that’s a really high price as I think it is overestimated. 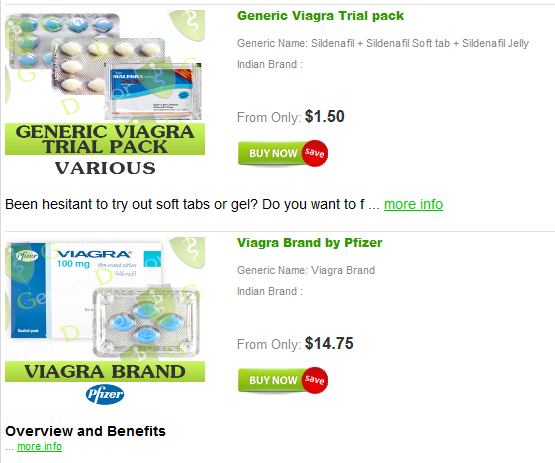 I also found out that the price for generic Viagra, lowest possible, is 0.86 USD. If you are a person that is mostly searching for Cialis then I found out the lowest possible price for its 20 mg form brand by Lilly it is 19.95 USD per pill and that’s again and overestimated price. The price for generic Cialis is going to be cheaper of 0.98 USD per pill lowest possible price. The brand Levitra by Bayer is going to cost you 12.44 USD per pill and its generic version is going to cost you 1.45 USD per pill. To be honest, I wouldn’t call those the best prices by far. Purchasing from this online pharmacy is hardly going to allow you save some money compared to other online pharmacies that have much better prices. the prices are fairly good for generics, but not the lowest, and they are really high for branded drugs. I do think that the pharmacy should re think their pricy policy to call themselves the *lowest prices pharmacy*. To my opinion, the price policy at this online pharmacy does not deserve more than 3 stars here. As it was already mentioned, this pharmacy is claiming to offer world wide shipping and this means that customers can order here regardless of where they live. Customers are able to chose between 2 shipping options at this pharmacy and it includes; regular shipping option with a fee of 15 USD and delivery period of 11 to 19 business days which doesn’t have tracking and the second shipping option is EMS with a fee of 25 USD and delivery period of 4 to 7 business days and it does offer tracking online. Unfortunately, there is no next day delivery being offered by this company. The problem is that I found no information about shipping prices anywhere on their website (not on FAQ page or main page) as I was able to find the shipping fee only on their checkout page. That seems to be inconvenient as customers may want to know the shipping fees before actually getting to order. 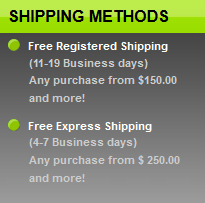 I do think that the prices for shipping fees are really high. The pharmacy does offer a free shipping option, everyone who purchases in bulk (over 150 USD) will get free standard delivery. I hardly think that there is someone who would want to spend so much for getting a free delivery. On their FAQ page I managed to find out information suggesting that the pharmacy is getting a free reship or full refund in case the goods are not delivered. In the end, genericdoctor.com shipping policy has issues that should be fixed. The shipping fees are not displayed, they have no overnight shipping policy, high shipping fees and to get free delivery you should spend a lot. I cannot offer this pharmacy more than 3 points here. According to the information on their website, the customers are able to pay for their medications using several different methods such as: Visa and Master Cards (Credit and Debit); EntroPay Virtual Credit Card; eCheck / ACH; Direct Debit; Western Union; Bitcoin; Fast Debit Pay (Online banking via email, as easy as Paypa!). 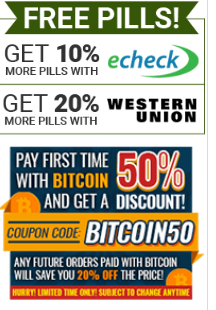 there’s information suggesting that customers can get 10% more pills if they pay with echeck, 20 % more pills if they pay with western union or a discount of 50 % for their first Bitcoin pay and 20 % off their order for further Bitcoin order pays. As much as we can see, the pharmacy is encouraging their customers to use those specific payment methods, but in the end, customers can choose whatever payment method they want. For the diversity of the payment methods used at this online pharmacy I can easily give them a rate of 5 stars as there seem to be enough payment methods for all customers’ needs. Before checking the loading speed of this website I should mention that I had big issues with the loading myself and without checking the google tools I am going to say that the page speed is very slow. I wanted to confirm this by checking the information on google page speed insights and indeed, I’ve got very poor results there. As much as we can see, the mobile version of the site is red marked meaning that slow page speed is guaranteed while the page speed for desktop is yellow marked meaning that page speed should be average. I’ve got big problems myself while trying to browse the website as I had to wait for each page to load for at least 30 seconds or more with multiple reloads of the site. I don’t the page speed load is very slow and for this reason my rate is 1 point. Mobile users cannot arrange orders here and for this reason, my mark is 1 point for this unit. I remember the pharmacy’s promise they are using a secure connection on their website and so I decided to check it. Luckily, the pharmacy does seem to have a secure connection and every page of this pharmacy is 256 bit SSL encrypted meaning that customers data is safe to be sent here. 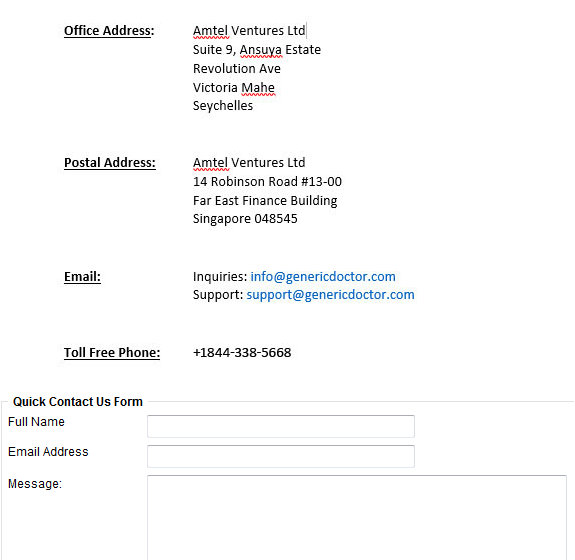 The only problem is the fact that this online pharmacy is not sharing the owner information and that’s not a good sign. In the end, my rating is 4 stars for security but no owner information offered to customers. 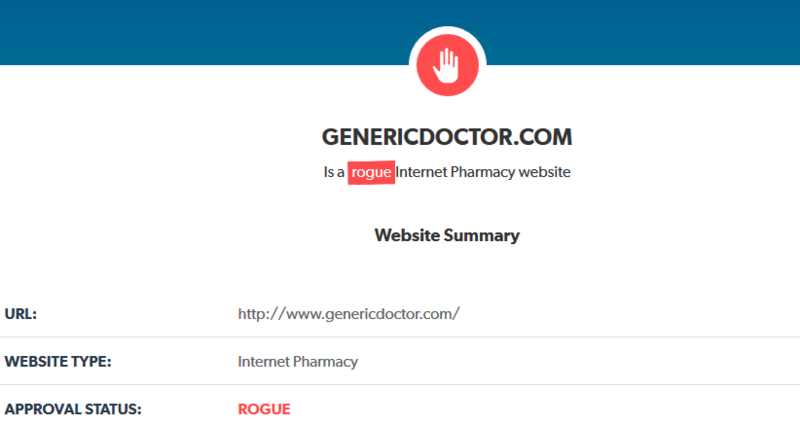 Regretfully, but genericdoctor.com is not using an antivirus on their website and that’s a big problem making the ordering on this online pharmacy not being so secure. High standard online pharmacies should use an antivirus on their website to protect customers from getting viruses on their website. as long as they do not have an antivirus on the site, customers should ensure they have a virus installed on their own device, otherwise you might risk catching viruses. Since it is not secure to place an order on genericdoctor.com, I am going to rate them with 1 point only. Review the information and click *continue checkout* you’re going to be asked to register and without an account – you won’t be able to go further. 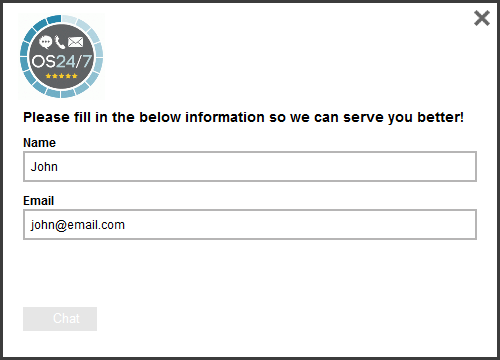 I honestly find it super inconvenient and I think that the registration is not a real need. This allows the administrators to collect personal information about the users and this can be super inconvenient for some people. After registering you should select the shipping option, shipping/billing address data and enter payment method. Since it is mandatory to register here my rate is 3 stars out of 5, I rate them with this because you can change language of the site, see the price per pill and the register procedure is not too time consuming. As much as we can see, the site is having 0% trust rate and since it is low trust site, it may not be safe to use it. The domain age is 9 years as promised, however the exact address is not as promised: the site seems to be from Russia with a Russian phone number, while on site they claim to be from Seychelles with a different phone number. Owner, organization and address are all hidden information with many alarming notes. My rate is 1 point. 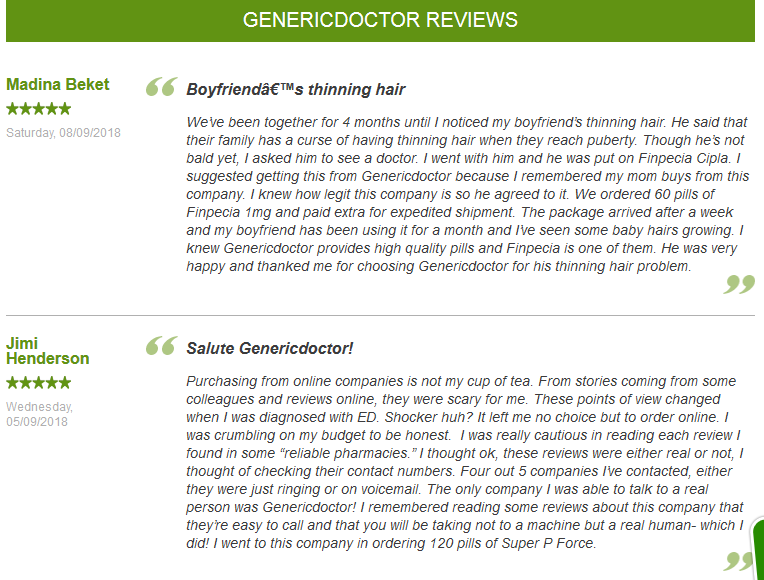 Sadly, there is no prescription required to complete an order online with genericdoctor.com and that’s a big problem. It is obvious that this is helping customers to reduce the time spent for ordering but it is better to change this non prescription policy. Nevertheless, not asking for a prescription is a sign of illegal activity of the pharmacy. The prescription requirement will attract more people because that’s a sign of legal and high-quality pharmaceutical business. For now, not asking for a prescription makes me rate them with 1 point. According to the information I managed to find on legitscript.com the site is rogue internet pharmacy that we shouldn’t have trust in. Customers risk with their money by not getting anything at all or receiving counterfeit medications. My rate is 1 point. A very good way to judge the pharmacy is reading the customer reviews. I read the customer reviews on their own website to check if the site is reliable and by doing my research I found *customer reviews* and *expert opinions*. By firstly checking the reviews I found absolutely positive reviews only. The reviews seems to be unique and recently added. What’s strange is that they are all positive only. Experts reviews are also perfect. That’s all too strange. No reviewer rated it with at least 4 stars. it is hard to have trust in reviews that all rated the site with 5 stars only. For this reason my rate is 4 stars. While I was searching for customer reviews on foreign websites, I did managed to find a few positive reviews but most of them seem to be outdated. However, I noticed that most of the customer reviews are negative suggesting this is a scam pharmacy. Although there are indeed a few positive reviews, most of them are negative and all suggesting the pharmacy is a scam. 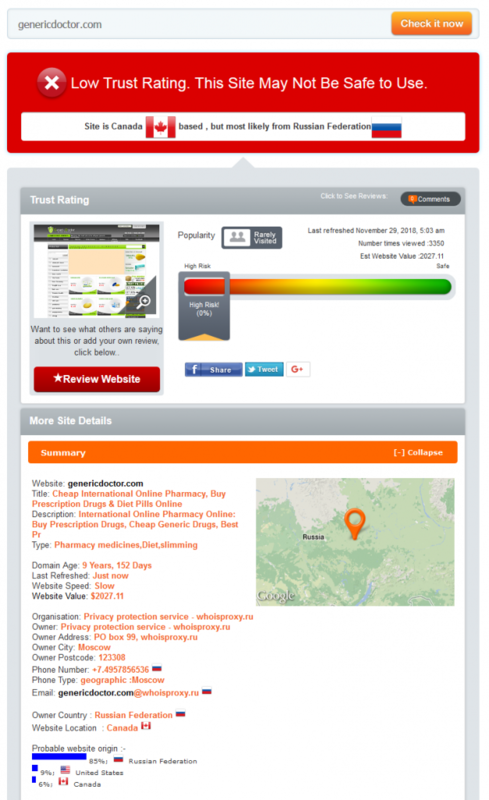 Even scamadviser.com detected bad reviews about this pharmacy. I have no idea how it is possible that there are a few positive reviews among such a big list of negative reviews on different websites which makes me think they are written by the site administrators to elevate the site’s reputation. 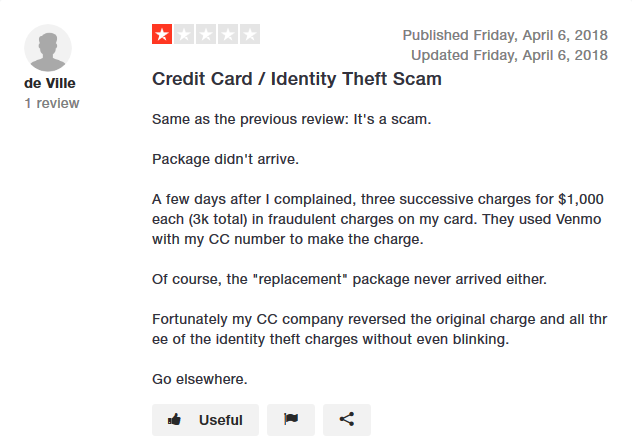 Since there are barely a few positive reviews and all of the rest suggest the site is fraud – my rate is 1 point. By searching for coupon codes for this online pharmacy I was not able to find any which is a very big problem to my opinion. The coupon codes are going to attract more customers and that’s especially since their price policy is by far not the best as they have claimed. The only coupon code is BITCOIN50 that offers 50% discount for first payment with Bitcoin and 20 % for further orders paid with bitcoin. But I already mentioned this. Another way to save money is the free shipping as I already said for bulk orders, bonus pills by paying with echeck or western union and discounts by purchasing medications in bulk. I do think that the coupon codes policy needs some improvement but in the end, I still think that Generic Doctor deserves a rate of 3 stars for all I found on their site. By getting on their contact form I was trying to find out what ways customers are able to get in touch with this pharmacy. I found out the pharmacy offers the contact form, a toll free phone number, 2 email addresses, the office address and the postal address. What’s strange is that the office address, postal address and address on scamadviser.com are all different. That’s all too strange and that’s why my rate is 4 stars. Except for all the ways to get in touch with this pharmacy I mentioned above, you can also use the live chat. I tried to get a consultation and I clicked on it. The following was displayed and I couldn’t go further it. That’s really sad they claim to have live chat that cannot be used. I still tried to get a consultation by writing an email – they claimed the response is going to arrive within 12 hours, mostly within 3 hours but I wanted for 24 hours and still no response ever arrived. Obviously – my rate is 1 point. GenericDoctor.com is an online pharmacy claiming to offer the best prices for medications but I managed to find that this pharmacy is lying about a multitude of different things. For example, the pharmacy definitely does not offer the best prices, they claim to have office in Seychelles while Postal mail is in Singapore but the scamadviser.com information suggests they are from a high risk country – Russia. The pharmacy does offer a rich assortment of different medications with coupon codes, they do offer world wide shipping (without overnight shipping) and a lot of payment methods and they have a secure connection on the site. These are the only good points while all the rest are not as good. Except for the fact they lie about the location and about the best prices, they have also lied with the customer reviews I managed to find on their website which are all positive while on foreign websites they are mostly negative suggesting it is a fraud company. scamadviser.com and legitscript.com do agree with this as a multitude of problems were found. The technical characteristics including load speed, mobile version, antivirus and convenience of ordering here are all very poor at GenericDoctor.com. Except for this site being most likely a fraud pharmacy, they have no customer support with non functional live chat service to make me think otherwise. I would recommend to stay away from this site. My order was processed and sent out in a timely manner. The customer support is polite and my order arrived as expected and I would definitely order from them again. After looking up their reviews with the pharmacyreviews I decided to order my meds through genericdoctor. Combining the cost of both prescriptions I saved $120 compared to what I was paying my local pharmacy. I recieved my prescriptions sooner than expected with no problems whatsoever. Found a drug I couldn't find at my local pharmacy quickly and received in good time from overseas. Will absolutely use genericdoctor from now on! This was my first order with genericdoctor. The customer support is very knowledgable and pleasant. I have received the prescriptions in 10 days. I will be back. Great ordering experience and quick shipping. This will be my go to pharmacy for future rx needs! I highly recommend this genericdoctor! 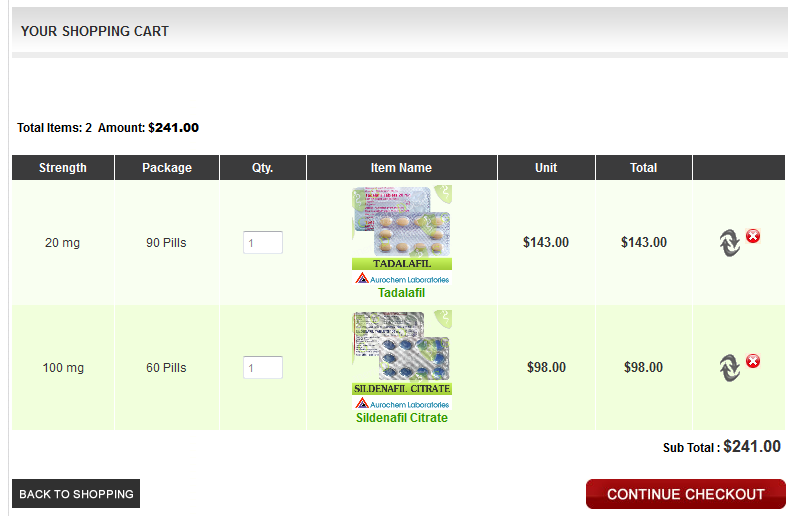 Awesome, Im so glad I found this online pharmacy! They do all the work, they have great prices, wouldn't change a thing and I would recommend to anyone! store was easy to navigate and fast at checkout.. the drugs were shipped very fast and i'm very happy with the quality. will certainly order again! I was searching for some good ed pills for a long time. No one works good for me (viagra, levitra, cialis). I ordered Manforce one month ago from GenericDoctor.com and the pills are working great, I'm happy, Manforce really works!